It has been a while since I’ve been able to sit down and write, and as you can imagine a lot has happened in the interim. Let’s play catch up. Apologies if this isn’t a coherent blog post – there’s a lot to cover so feel to pick and choose to read what interests you! I've broken it up into 4 different posts. After Sukkot break, we returned to working at our schools. I was really happy to see my students again after spending a long time away from them. As always, the students greeted the other fellow at my school and me with an abundance of hugs whenever they saw us. Additionally, it’s hard to go anywhere without hearing a prepubescent voice screaming our names. One student asked me if I had this many fans in the States. If you’re wondering, I definitely don’t. After a hard week readjusting to being in school, I took a trip to Rishon Lezion to spend the weekend with a family that I’ve had the pleasure of knowing since 2008. The family, the Yehudas, were kind enough to host me for an incredible Shabbat dinner – legitimately the best food I’ve eaten while in Israel. Having known them for quite some time, I felt very comfortable being there. It felt like a Shabbat dinner with family. Maayan, the youngest of the family, and I spent the night post-Shabbat dinner at a bar in Rishon. Rishon definitely has a lot more to offer on Shabbat than Petach Tikva, so it was a nice change of pace for me. Saturday was spent having a late Shabbat brunch with my absolute favorite Yemenite delicacy- jachnun- which is traditionally served on Shabbat because it slow cooks overnight and there is no need to break the no electricity on Shabbat rule. I for sure put on a couple pounds after my weekend with the Yehudas but again, no regrets. Maor, the middle child, Maayan, and I then went to see a movie (PTK also lacks a movie theater but I’m not bitter or anything). It was my second time seeing the movie, Let’s be Cops, so I tried to use the opportunity to practice some and read Hebrew subtitles but JESUS those things change so quickly. At least I tried? After the movie, Maor, Maayan, and I indulged in a beer and a football (read: soccer) game (watching not playing…what do I look like?) before returning to their home. In true Persian fashion, they packed some Tupperware filled with food for me to take home. It was something that they saw as a small gesture, but it seriously meant so much to me. That sounds silly, I know, but it reminded me of something my own family would do. I was extremely appreciative to spend the weekend with them. Like I’ve mentioned before, it’s not always easy being so far away from my parents and sister (I’m getting teary eyed as I’m writing this, gross) so it really means the world to me when people do so much to make me feel at home. The Yehudas are an incredibly beautiful family and I am forever grateful for every moment spent and every pound put on during my weekend with them. 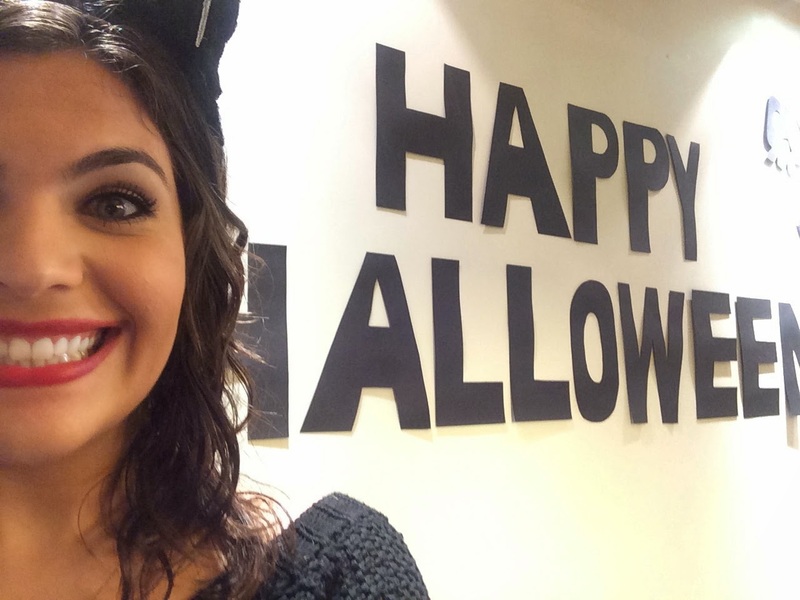 After my weekend in Rishon, I felt reenergized and was excited for the week ahead because that upcoming Friday we would be celebrating my absolute favorite holiday- HALLOWEEN! 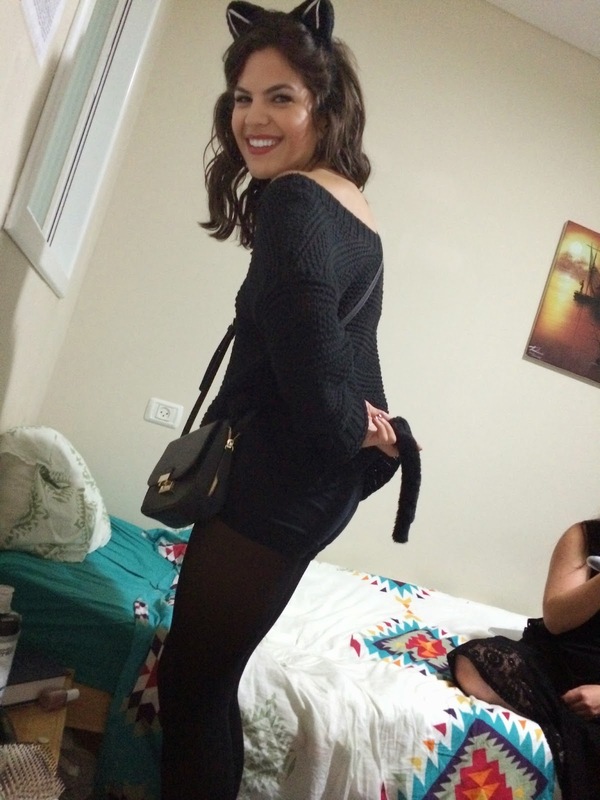 Even though Halloween isn’t traditionally celebrated in Israel, a few friends on the program decided to throw a little Halloween party in their apartment. Between working and running errands, I didn’t really have much time to throw together a proper costume but thankfully Maayan lent me some Catwoman paraphernalia in order to create a makeshift costume. The party was a lot of fun and surprisingly had more Israelis in attendance than Americans. I decided to spend the night at my friends’ apartment since it was torrentially down pouring outside and I refused to brave the walk home. The next morning I took the worst walk of shame home. Why, you ask? Because I had to walk home in my costume, which would not have been a big deal had I not run into the VICE PRINCIPAL of the school I work at. Safe to say I had THE shortest conversation with her before I ran home. My life, your entertainment. The Sunday after Halloween, our program joined a billion other Masa programs (rough estimate) for a Masa opening event in Jerusalem. It was a great night filled with an inspiring speech by Prime Minister Benjamin Netanyahu, a great performance by the Idan Raichel Project, and another delicious stop on our hotdog tour of Israel (ranking #2 to be exact). It was very exciting to socialize with other English speakers and learn more about other Masa programs. 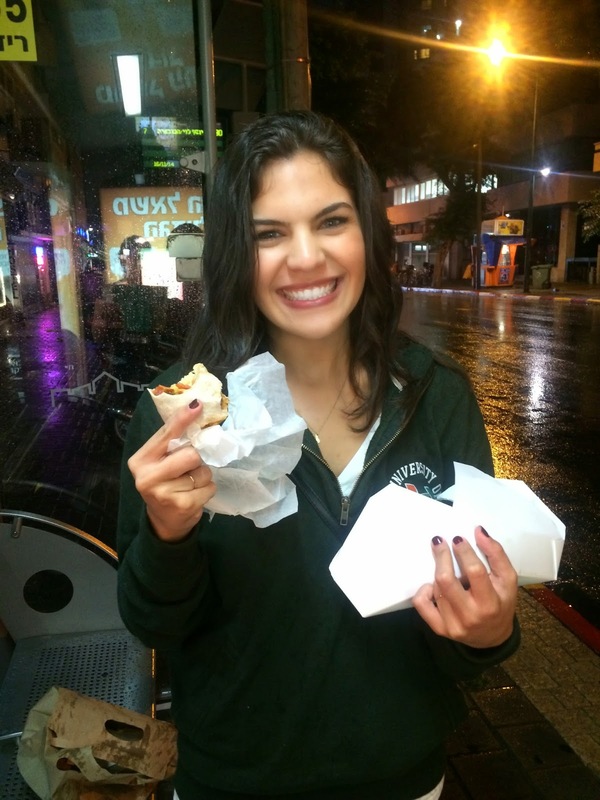 The most recent exciting event to occur was a late night excursion my friend Jillian and I took to Tel Aviv. Jillian is a Florida State University alum while I am a University of Miami alum, so we were determined to watch our rivalry football game this past Saturday. Only catch was that the game was airing at 3 am Israeli time. Still, we remained committed to our dream of watching the game. SO, at about 12 AM Jillian and I headed out of little ol’ PTK and made our way over to the city where anything is possible – Tel Aviv. We watched the game at Mike’s Place, which is an American-style sports bar where all of the staff speaks English and dreams come true. We waited anxiously for the game to begin while enjoying a couple of drinks and nachos. The bar had agreed to stay open for us to watch the game but once it hit halftime we felt bad making the staff wait for us considering we were the only ones in the bar. Jill and I decided we would sit outside the bar and stream the game using the bar’s Wi-Fi, but Mother Nature had other plans in mind and quite literally rained on our parade/plans. It was now 6 am so Jill and I figured it was probably time to head back to our homes. My team ended up losing in the last 4 minutes of the game, but I left Mike’s Place with a burrito so it wasn’t a total loss in my book. 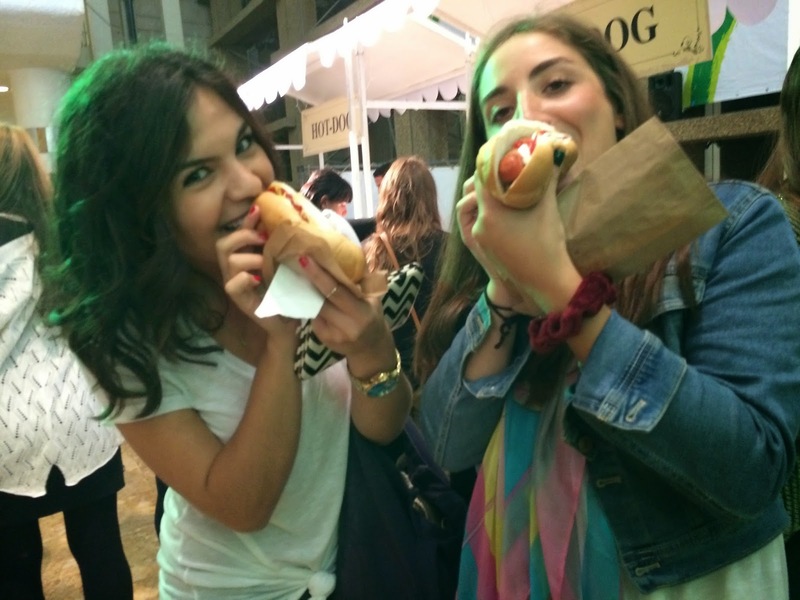 Another exciting event that I was able to attend was a wine festival in Sarona, Tel Aviv. Anyone who knows me is well aware that there are about a million other things I’d choose to do before drinking a glass of standard red/white wine (I will take a beer over wine any day), BUT the event promised cheese plates and Prosecco as well so I was very keen on going. Sarona is a beautiful, relatively new area that is referred to as the “little Italy” of Israel. I have been mentioning to my friends how much I wanted to check out Sarona, so the wine festival was a great opportunity. It ended up being an incredibly fun evening – I indulged in delicious cheese plates (2 to be exact) AND even found a red wine I enjoy! How’s that for new beginnings? I look forward to heading back to Sarona once the weather. There is a restaurant there that allows restaurant goers to takeaway their meal with a borrowed blanket and picnic basket in order to have a picnic on the grassy areas of Sarona. It’s definitely somewhere I am hoping to bring my family when they come visit.